How far would you walk to protect the freedom of others? How many days would you go without food in the name of democracy? What would you be willing to sacrifice? For Han Lin, a facilities attendant in physical plant and father of three current IC students, the answers to those questions are: As far as I must walk. As long as it takes. Everything -- even my own life. Facilities attendant Han Lin puts his life on the line for democracy. Americans are guaranteed democracy and freedom by the U.S. Constitution. Lin, a Burmese political refugee who relocated to the United States in 1997, is still fighting to have those rights guar an teed in the country in which he was born. 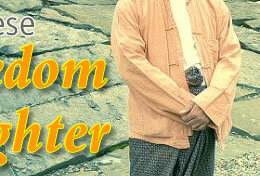 Since 1962 Burma -- renamed Myanmar in 1989 -- has been under the control of military regimes. Mass demonstrations in 1988 forced the first regime to step down, but the military re gained power two months later in a bloody coup. The army installed martial law and placed Aung San Suu Kyi, leader of the main op position party, under house arrest, where she remained for nearly six years. To quiet growing resistance, the military-run government held a general election in 1990. Although Suu Kyi's party, the National League for Democracy, received 82 percent of the vote, the administration denied its own defeat. When years of negotiations completely collapsed in 2000, Suu Kyi, who had been awarded the Nobel Peace Prize in 1991, was again ordered into confinement. This time she remained a prisoner for two years. 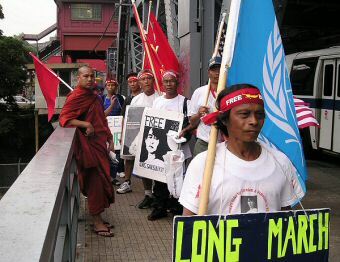 Last May, during a rally in Depeyin village supporting Suu Kyi, intelligence officers and soldiers posing as monks and villagers killed her party members with bamboo sticks and spears. They also fired guns into the crowd; about 70 people were killed. Suu Kyi was forced into house arrest for a third time. Hundreds of her supporters were arrested. She remains a prisoner in her home, and her faithful followers around the world are desperate to get her out -- and welcome her back to her rightful position as the democratically elected leader (officially general secretary) of their country. Her vice chair, U Tin Oo, who was injured in the Depeyin massacre, is being held as well. Sein Win, who was elected prime minister in 1990, lives in exile in Washington, D.C., where he continues to champion democracy under the banner of the National Coalition Government of the Union of Burma. One of Suu Kyi's expatriate followers is Han Lin. Before the 1988 junta, Lin was a middle school math teacher. He was a village leader, teaching about democracy and speaking out against the regime. Han Lin (fourth from right) and his compatriots on the long march from Albany to New York City. Although he knew that political activists and organizers around the country were being killed and imprisoned, Lin's hope of winning peace and freedom gave him the spirit to push on in the fight for democracy. As his village's political organizer, Lin faced constant threats from soldiers. But he re fused to be silenced. Eventually, to avoid being killed or imprisoned, Lin made the tough decision to leave his village and his wife, Htay, and their five children, ranging in age from 5 to 15. He set out for the jungle bordering Thailand, crossing mountains and rivers engorged by monsoon rains. It took him nearly a week to reach safety in the jungle, some 100 miles from his village. For two years Lin was unable to see his family. When word reached him that authorities had put a gun to his wife's head to try to get information about Lin's whereabouts, he sent her a secret message asking her to join him. She and their children, traveling separately to avoid detection, made their way to Han's hiding place. The Lin family lived in the jungle for a total of six years before crossing the border into Thai land and receiving refugee status. During that time they welcomed a sixth child, Thu Yein, now 12. Three of Thu Yein's siblings -- May, Tayza Yee, and Thuya -- are now IC students, and one, Aung, works in IC's physical plant like his father. The oldest, Ne Lin Tun, is studying electrical engineering at Purdue University. The children were all too young to think of their time in the jungle as a struggle. Tayza Yee '07, a student in the Exploratory Program, barely recalls anything about those six years. He does re member his father teaching him math. And he felt that a big change happened when the family achieved political refugee status and left Thailand for the United States. He was just shy of 13 years old. In recalling her childhood in Burma, May '05, a health sciences major, can think only of violence. Her most vivid memory is that of military authorities driving up to her family's house on motor cycles. They seemed drunk, handling their guns as if they were toys. She also remembers her family leaving home in the night. "The moon was really shining," she says. For an eight-year-old, the secret journey -- which required following a man on a bicycle, walking for hours through a forest, crossing the sea on a boat loaded with jelly fish, and riding an elephant -- seemed like an adventure.